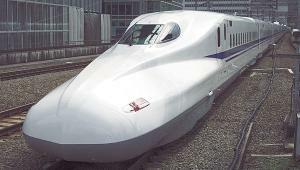 DailyTech – Bullet Trains to Offer Wi-Fi in Japan . NTT Communications will offer Wi-Fi services on the new N700-type bullet trains that offer the fastest train travel services between Japan’s two largest cities of Tokyo and Osaka. The distance is roughly 341 miles and takes about three hours. The Wi-Fi internet service will be an extension of the company’s HotSpot service, which offers internet accessin places such as stores, restaurants, hotels, libraries and other locations across Japan for a monthly fee. Connection speeds of roughly 2Mbps (bits per second) will be possible through the service, which will be provided by a wire travelling alongside the bullet train track from which signals can be sent and received wirelessly. NTT Communications will also launch Wi-Fi internet access in waiting lounges on all 17 stations along the route. The service will be charged at the current standard HotSpot rate, which ranges from 500 Yen ($5.73USD) per day to 1,680 Yen ($19.25USD) for a monthly subscription. Plans for a wireless internet service on bullet trains were first announced in 2006 but were held back until the new N700 trains were launched to avoid retrofitting of older trains with the Wi-Fi technology.